I have a little secret. I’ve been holding out on you. See, I’ve been making these Hasselback Scalloped Potatoes for months now and never posted them. They’re amazing, they’re gorgeous and they’re amazing. Oh, I said that already. Well, I can’t say it enough. So to go on the blog, I need a photo and every time I’ve made these we’ve just gobbled them all up before I could even get a picture. They’re that good. Even these photos were rushed as I ran off with the potatoes to cries of, “Hey, where are you going with that?! !” from the folks who were gathering at the dinner table! Hasselback au Gratin potatoes are make little noises when you eat good. They’re take a second and third helping even if you’re already stuffed good. And they’re sitting around the table talking as you finish dinner and picking little crunchy bits from the nearly empty casserole even as you say, “I have to stop!” good. They’re Hasselback because they’re stacked sideways & sticking out of the pan on top and the ridges are supposedly reminiscent of the Hasselback Hog. What baking these potatoes vertically like this does is gives you a crunchy, cheesy top part while the bottom of the potatoes in the casserole are infused in a creamy, dreamy garlicky deliciousness. Best of both worlds! I first had Hasselback Potatoes in Cream from an old barbecue book but then I came across a Serious Eats post. They were good but we were just slightly underwhelmed – they just weren’t quite “Wow.” So the next time I made them, I boosted the flavors a bit (I replaced the garlic with powder, too, so the cream was totally infused, and left out the thyme which we were a bit Meh about) and went much heavier on the salt (almost a full teaspoon) than I had before. Then I ran out of time & in a panic put them in the microwave 1st for a head start and then into the oven. That time in the microwave was the bit of accidental alchemy that seriously took this dish over the top. It makes sense given all I’ve learned about twice cooking fries & potato wedges (like my Bomb Baked Potato Wedges) to make them crisp. The top of the potatoes are really getting that same kind of treatment. You could just bake them for an hour and a half but I seriously recommend trying that microwave treatment! I just want to note that In these pics I had these giant russet potatoes. I didn’t even realize how huge they were until I got home and opened the bag. Usually, with more normal sized potatoes I get three rows. And of course you want to watch for sales on potatoes but it’s the cream and the cheese that are the pricey items. I always pick up extra cream around holidays when it’s about 1/2 price and I never pay full price for cheese. Watch for a good sale and coupons and chuck it in the freezer and make sure to use a good, sharp cheddar for this. You aren’t looking for gooey cheesiness but a baked on crispiness. Adjust oven rack to middle and preheat to 400 degrees F.
Add half the Parmesan, Asiago or mix of both to a large bowl. Mix in cream, minced garlic or garlic powder & salt and pepper. Add potato slices and toss to coat, separating slices so each potato is covered. Grease a 2-quart casserole dish (I use an 11 x 7″) with butter or spray. Working by the handful, pick up potatoes, trying to keep a little cheese between the slices and pat into a fairly even stack. You’re looking to keep the side edges of the potato pretty even but have a lot of variation in the stack on the top edge. Working in rows along the outside edges, place in casserole with the top edges up and aligned vertically. Continue placing potatoes in casserole, working around the perimeter and into the center until all potatoes have been added and potatoes are pretty tightly packed. You’ll want them tight enough so that you can’t get a finger width in, but not so tight that there’s not room for the cream to seep through. If necessary, slice additional potato, coat with cream mixture, and add to casserole. Pour excess cream/cheese mixture evenly over potatoes until the mixture comes half to 2/3rds of the way up the sides of the casserole. You may not use all the cream or you may need to add a bit more. Mix the reserved Parmesan/Asiago with the cheddar cheese and set aside. Method 1: Cover tightly with foil and transfer to oven. Bake for 30 minutes. Remove foil and continue baking until top is pale golden brown, about 30 minutes longer. Carefully remove from oven, sprinkle with remaining cheese, and return to oven. Bake until the potatoes test done with tested with a knife (it should slide in easily with little resistance) and the top is deep golden brown and crisp, about 30 minutes longer. Remove from oven, let rest for a few minutes, and serve. Method 2: Cover with a layer of plastic wrap and microwave on high for 30 minutes. Make sure to preheat oven at appropriate time so it’s at 400 degrees F. when the microwave time is over. Remove from microwave, sprinkle with cheese and bake for 30 minutes until the potatoes test done with a knife (it should slide in easily with little resistance) and the potatoes are crisp & cheese is melted and deep golden brown. Remove from oven, let rest for a few minutes, and serve. Note: there is always going to be a bit of variable in this dish – depending on the shape of the dish & the size of the potatoes you may need more or less to fill the dish. That can affect just how much cream you’ll need, too. I try to eyeball the potatoes next to the dish to estimate how many I’ll need but be prepared & have an extra potato on hand if you need to fill in. I’ll be bringing this recipe to Angie’s Fiesta Friday! This entry was posted in Click here for Fabulous Food Posts and tagged au gratin, au gratin potatoes, cheddar, Cheese, Cream, hearty sides, J. Kenji López-Alt, Potatoes, serious eats, Side. Bookmark the permalink. Thank you for the beautiful share – perfect with a nice glazed ham! I put a lot more of my meals on Instagram but I still miss so many! I’m sure you have enough other things to do!!! oh gosh, there’s so many platforms!! Too many! It’s not worth trying to cover them all!! I can’t believe you’ve been holding out on us…lol! This looks amazing Mollie! Thanks, Antonia! I really did want to post these before, but in the long run, I guess I just HAD to keep making them lol! Thanks, Nancy – yes, do try them! I’m sure you’ll fall in love with them! Wow these look divine! 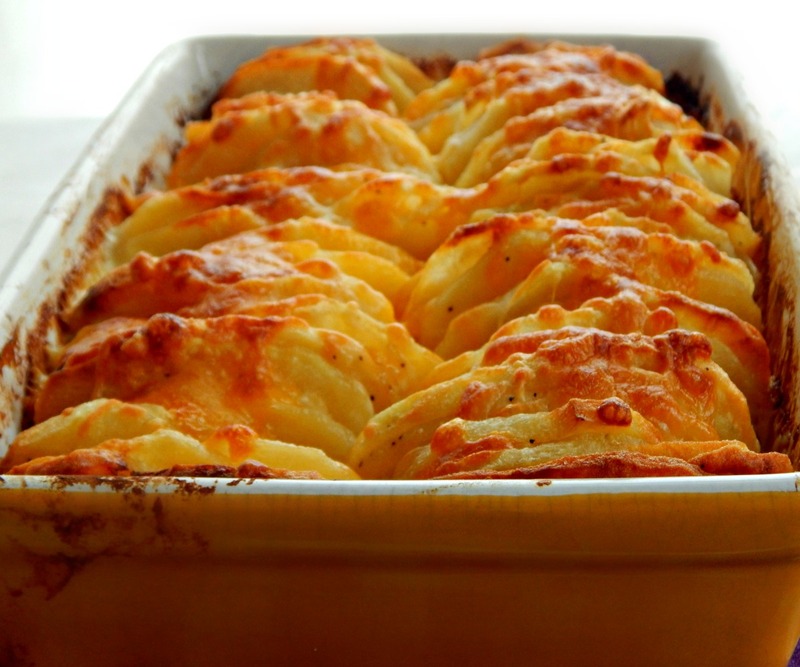 Hasselback and gratin…match made in foodie heaven. Recipe bookmarked! I’m sure these are good with all that cream and cheese. I love this blog and if I ever quit mine, I’ll keep coming back for the greatness that is in this blog! I can’t quite for a few reasons: 1) I KNOW that it takes time to start a business so, not giving it enough time will certainly make it fail 2) I’ve already invested so much time and effort into it 3) I am capable to do this. I’ve overcome harder things in life and I believe in myself! Confidence will get you everywhere in life! Mollie those potatoes look great. I’ve never made hassleback potatoes before they are so beautiful. You have taken the original recipe and amped it up making a really delicious potato dish. Looks fantastic. I haven’t had scalloped potatoes in a long time, Mom used to make them and serve with meatloaf, YUM!! This really is a wonderful recipe – and on this one the potatoes are sliced all the way through unlike some recipes where you have to leave the bottom of the potato intact so it’s so much easier than trying to cut partway thru a potato! What a great idea! I’ve always lamented that scolloped potatoes do not have enough crispy bits. And microwaving is inspired. I need to try this. I know, right! I joke around with my folks that if I didn’t take a picture, it didn’t really happen, lol! Thanks much for the pin!! How DARE you hold out on us like that, LOL! These look seriously fantastic Mollie, I’ll definitely try your microwave tip too. I was there one night when she served them and I have to say they were DELICIOUS! I definitely had more than a normal serving size because they were so good. I’d recommend them to anyone!! How did you know au Gratin Potatoes of any kind are my favorite. I have never made home made au gratin, always had packaged growing up or other people have made them. Now I have to because these looks phenomenal 😀 Thank you for sharing! ! Oh, then you HAVE to try these. I mean they are just potatoes, but man are they good! 🙂 And yes, we had the Betty Crocker Scalloped Potatoes when I was growing up and we might have even had hot dogs cut up and mixed in with them now and then, too. Ugh!